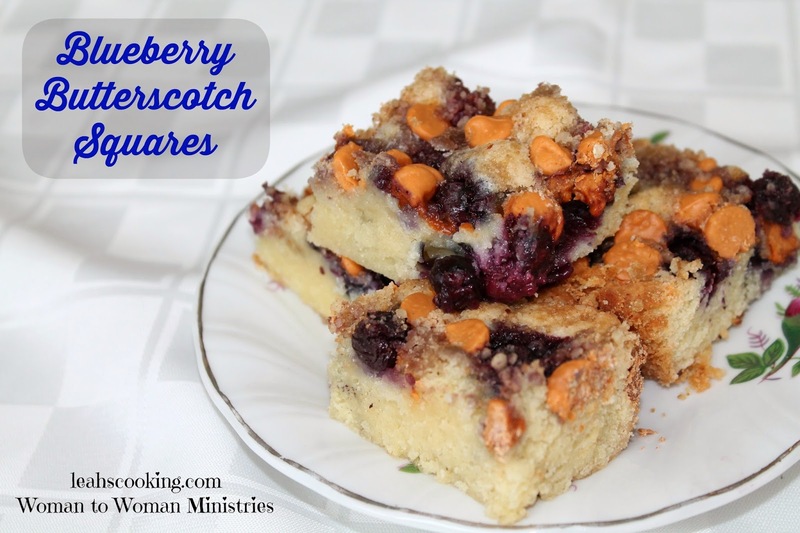 So I've been missing for a few months but I am back again today with a delicious recipe for Blueberry Butterscotch Squares! I have a friend here visiting this week and we made them (rather she made them for us) and she loved them just as much as we do so I'm pretty sure you will be pleased with this recipe and hopefully it will be a keeper for your family as well! Cream butter until light & fluffy. Gradually add sugar. Beat in eggs, then stir in dry ingredients. Fold in blueberries. (It works better to mix hem into the batter if they were frozen although if you have fresh ones I would just wait until you have the batter in the pan and then press them into the batter. Spread mixture in 9x13 pan. Sprinkle with chips, pecans & brown sugar. Bake at 350* for 30 mins. Top should be lightly brown.